Making Waders at Simms is Far from Easy and Further From Fast but the End Result is Well Worth the Time and Effort. 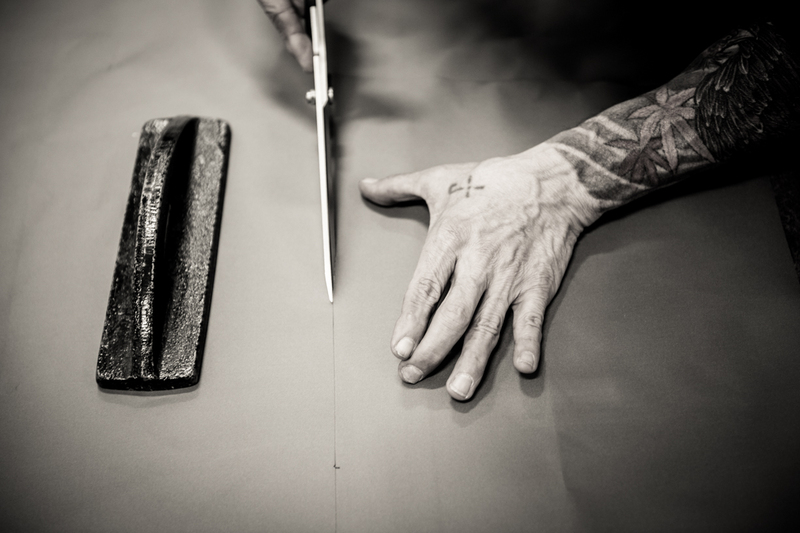 Manufacturing Simms GORE-TEX® Waders truly is a handcrafted process. It’s a process that has become the cornerstone of our heritage. We hold our quality standards at the highest level and sweat each and every cut, stitch and seam. Why? Because like you, the men and women who build your waders (The Wader Makers), wear waders too. Our process might not be the fastest way to make them but it sure has proven to be the best way to make them. Read on to learn more about Simms’ wader making process. The wader making process all starts with production planning. When size needs have been determined, the puzzle begins. CAD software is used to strategically lay the pattern pieces out in such a way that yields the best fabric utilization possible. After the Wader Makers figure out how to cut, they start spreading layers of fabric on the cutting table, checking for flaws all the while. When all the fabric is smoothed out, it’s stapled to the table and the pattern pieces are cut out by hand. The cut pieces then move into pressing. In the pressing area, belt loops, back labels, reinforcement panels, pockets (also made here at Simms), keychain holders, zippers (in some waders) are all pressed on. Next, the pieces are bundled into size sets of four and the bundles move into body sewing. This is where the wader really begins to take shape. To ensure ruggedness and durability, the Wader Makers use incredibly high stitch counts, double stitching and backtacking. Now that the bulk of the wader has been assembled, it’s time to tape all of the seams. At the end of each seam and seam intersection, a patch is attached for reinforcement. Once everything is taped and patched, the wader moves into hemming. The hemming stage of the process is where all the super detailed sewing takes place on the upper portion of the wader. Here, labels, suspenders, gravel guards and waist bands (G3 Guide™ Pant) are attached. From hemming, it’s on too attachments. While all the previous steps have been going on, there’s been another intricate process taking place all the while that feeds into attachments — footmaking. Foot making begins with sheets of neoprene that are die cut on a hydraulic press. These pieces get prepped, glued, marked, glued again and are then assembled by hand. When the feet are put together, they are pinched and taped inside and out. When the feet are attached, the connection is taped and prepped for testing. In the testing area, each and every wader (turned inside out) is filled with water and inspected for leaks. When the wader is deemed leak free, it’s adorned with zipper pulls, retractors, a belt, other included accessories and is boxed, scanned and placed in inventory, ready for a river near you. Topic(s) Fly Fishing, Simms, wader makers, waders by John Frazier. Bookmark the permalink.